I haven’t really been sewing at all nor updating my blog. So here is the latest from me! 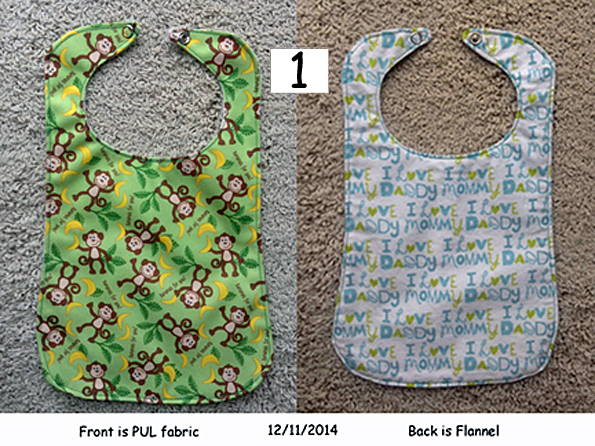 I made bibs for Grandson #2 first birthday January 22, 2016. I actually started making the bibs in November of 2015 and finished them in January. I found similar designs on the internet and used them to create my digitized designs. The bibs took so long to complete because my perfectionism gets in the way and I wanted the designs to be “perfect.” I also had to learn a lot! The bibs are made from “PUL” (Polyurethane) fabric which forms a waterproof barrier, while still being breathable. There are different qualities of PUL fabric. I backed the bibs with flannel fabric. extremely difficult to design and digitize. I had to learn many new techniques in order to make it stitch-out the way I desired. The teddy bear bibs below were somewhat difficult to digitize because I had to learn the “pathing” technique. A video on the website, “Stitcher’s Library” by Chris Tonne, was invaluable in the learning process. Unfortunately, Chris has taken the site down while she is on sabbatical to decide if she wants to continue her teaching. 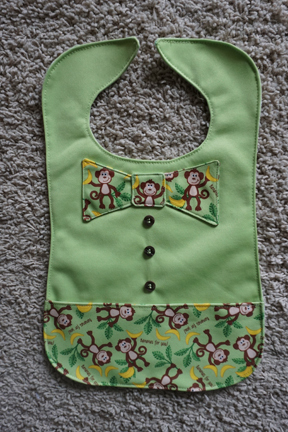 I finished four more monkey bibs for my grandson.. He has seven now which is probably enough. The pockets are all straight and even on the bibs. For some reason I can’t seem to the bibs to photograph correctly. 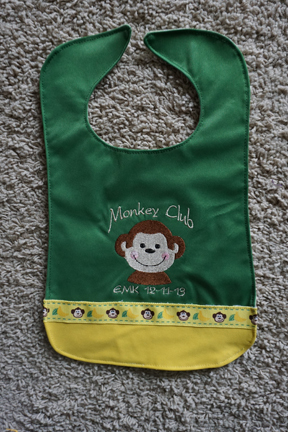 The Monkey Club bib has my grandson’s initials and birthdate on it. The bib with the bowtie is my favorite. I made three bowties before I got the monkeys placed right and figured out how to sew the bowtie so that I could turn the right sides out! 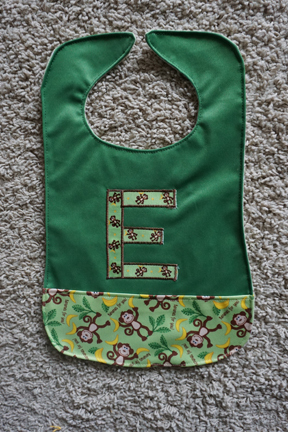 I used “Babyville” ribbon for the “E” applique. I am not all satisfied with how the applique turned out, but my grandson doesn’t seem to mind. 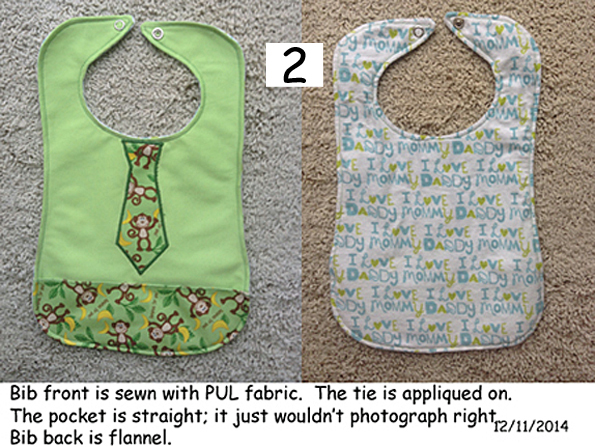 I used “Babyville” PUL fabric for the front of all the bibs and JoAnn’s proprietary flannel for the backs. The bibs hold up wonderfully wash after wash! 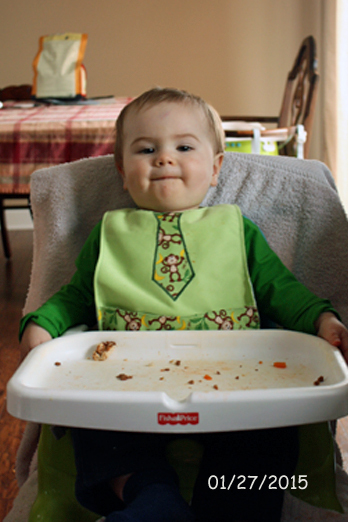 My daughter loves the bibs because they are a great length/width for her 16-months-old son and they absorb liquids without getting soaked. Also, the PUL fabric doesn’t seem to stain easily. I also learned that if you use a MicroTex Sharp needle and take it very slowly you can sew some pretty nice topstitching! 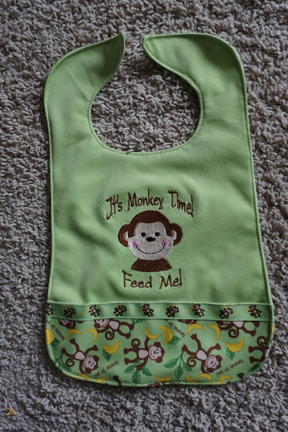 Sometimes I wish I could sell the bibs I make, but who would want to pay $18 for a bib? The Monkey Shirt is Done!!!! 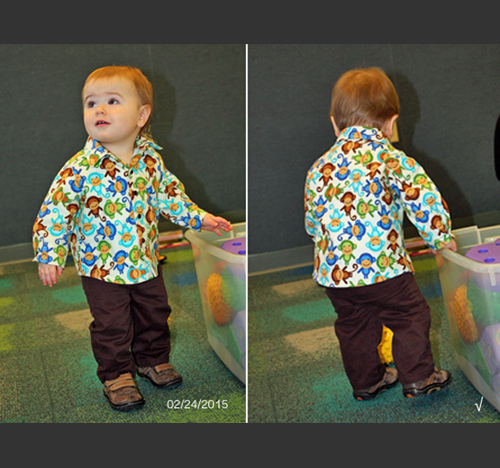 I finally finished my grandson’s “Monkey” shirt on February 21, 2015. I had a few days before I could deliver it to him. He wore it for the first time on February 24. I just didn’t get around to posting it until now. 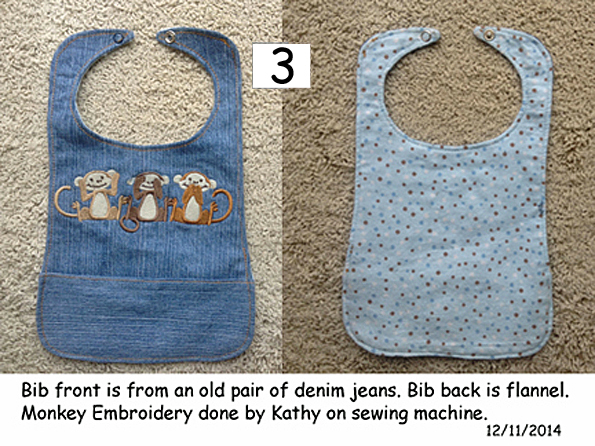 I really liked it when the Monkey Shirt after I finished it despite my mistakes. I had a lot of sewing techniques to “relearn.” I hadn’t done those things since I made my 35 year old son a little suit for a wedding. I had to relearn . . .
✔︎ How to sew on buttons. Can you believe I haven’t sewed a button on anything for a long time! ✔︎ And most of all PATIENCE!! I think he looks adorable in the Monkey Shirt below. My grandson is modeling the monkey bib I made him. I wonder, though, do you think he is a stuffed shirt? I think he may have been tired of all the photos I have been taking of him. This was the best smile I could get out of him at lunch today. I learned a lot when I made these! You can click on them to make them larger. After learning how to use PUL, I decided to make a pocket bib. I appliquéd the tie. Learning to appliqué on PUL fabric is interesting. There is no room for error because once the needle goes through the fabric you have a hole! Appliqué makes many holes. Time to be very careful! I made this bib from some old jeans of mine. I used a embroidery pattern from embroidery library. It is topstitched with jean thread. I used a large needle with a large stitch length. Next time, after talking to others, I will lubricate the needle. Well, now I off to sewing something else for my grandson. I am a member of the Pattern Review website, which is a sewing website. 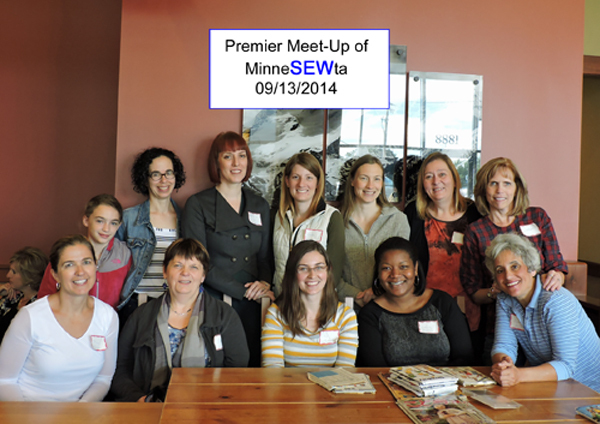 There are quite a few of us from Minnesota and the surrounding areas. We decided we should all get together and meet the people we “talk” and message with on the site’s forums. We had our first meeting on Saturday, September 13. We met at Caribou Coffee at 10:00 a.m. and talked until 12:00 p.m. WOW. Then we headed over to S. R. Harris which is a fabric outlet located in Brooklyn Park, MN. A lot of the sewists bought fabric to add to their stashes. I didn’t buy anything as I am trying to use up what I have — like THAT will ever happen. We all had a great time. It was such a wonderful experience to meet everyone! One of the women was from Winnipeg and another from Fargo! I completed this in mid-August, but I don’t like it. There is too much fabric in the skirt and it is really heavy and uncomfortable to wear. This wasn’t a problem in the full dress. I plan on taking the skirt apart at the seams and making it into a kind of gathered A-line skirt. I will have to remove the current waistline and redo it which will make the skirt several inches shorter. I think I will make the final length to hit right below the knee. I hope I don’t get as frustrated with this new refashion as the one I just did. I will post photos of the the first go as soon as I get someone to take them. Forgot to mention this was a TOTAL FAIL. UGH. Well, at least I tried!